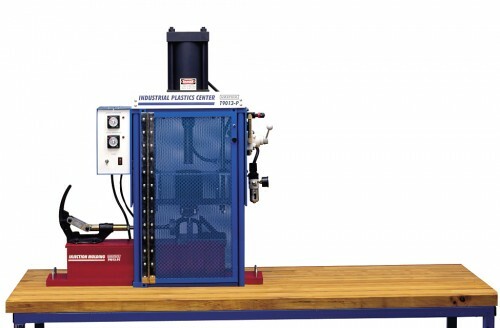 Amatrol’s 96-PLS1T Plastics Technology 1 Learning System is designed to teach modern technical skills in plastics and polymer science using injection molding. Plastics are found in almost any industry in an astounding array of applications, including clothing, housing, autos, aircraft, packaging, energy, electronics, biomedical devices, and many more. They impact virtually every aspect of modern industry. Understanding how to work with plastics is an important technical skill for engineers, technicians, and operators. The 96-PLS1T includes a temperature control system, 4 oz. shot material feed system with electro-pneumatic control, dual heater system, barrel and nozzle, safety enclosure, heavy-duty workstation, 8 ton clamping system, mold offset plates, set of injection starter molds, interactive curriculum for both theory and lab, and a teacher’s assessment guide. Learners will practice skills such as setting the temperature and pressure for a molding operation, mounting and aligning molds, operating an injection molding machine, troubleshooting molding operations, determining the runner and sprue diameter for a specific plastics mold, designing a plastics part and mold based on shrinkage and warpage considerations, using CAD/CAM with mold design, and multi-cavity mold design and operation. Amatrol’s 96-PLS1T Plastics Technology 1 Learning System includes interactive multimedia curriculum. It is the perfect instructional tool for today’s classroom with an exciting presentation and high quality learning content. Each topic’s presentation includes extensive videos, 3D animations, interactive exercises, and colorful graphics that will motivate students and help them learn more effectively. The multimedia software content mirrors the print-based Learning Activity Packets (LAPs). Amatrol multimedia software is skills-based and provides a complete learning experience for the student with theory presentation and hands-on exercises.